Wild boar chopstick rolls. Tatsoi with goat cheese emulsion. Black tea smoked Long Island duck with winter squash gratinette. Not the usual suspects, that’s for sure. 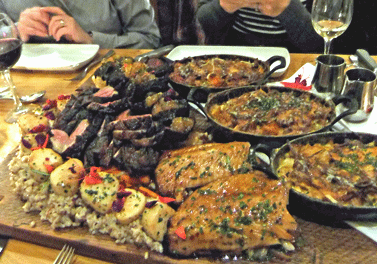 These were just a few of the items on an over-the-top tasting menu last week at Alchemy Bistro in Gloucester. 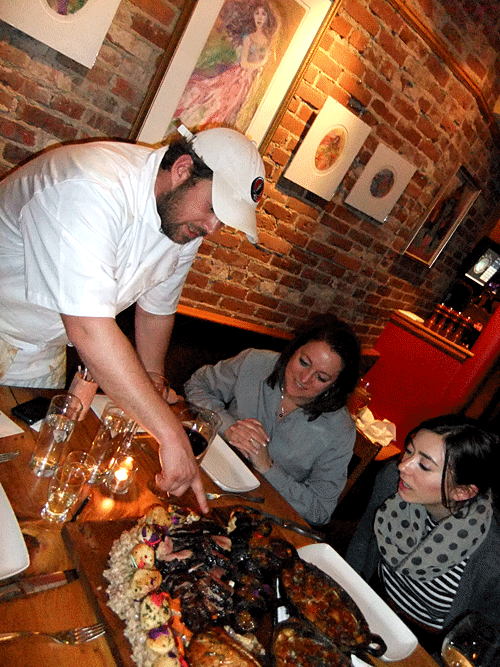 We were invited to the event along with other North Shore food bloggers, and to say that Chef Jeff Cala (shown above, giving diners a tour of the board) and his team went all out would be an understatement. 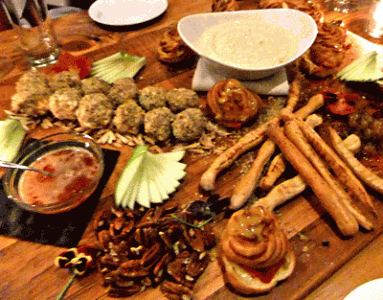 The appetizer, cheese, and entreé courses were served family style on huge boards custom made for the restaurant by Essex’s Walker Creek. It was a study in food still life, incredible taste combinations, and new experiences. There were wine and beer pairings, too, including one from the restaurant’s exclusive cellar: Corte Rugalin Monte Danieli Amarone Classico from Italy with the pasta course. 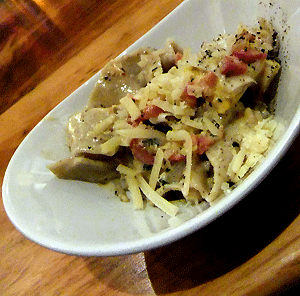 The chef’s outstanding black pepper pappardelle carbonara was brought to new levels by the wine. The papardelle was voted the favorite of the evening, but the wild boar, black bass, and smoked duck were all outstanding, and the warm chocolate souffle paired with Bourbon County Stout from Goose Island Brewing Co. made a lush, satisfying ending to the meal. But the best news is not how good the food was. It’s that the dinner we attended was a preview of a regular series being planned by Cala and Mark McDonough, who own numerous North Shore restaurants, including Alchemy, 15 Walnut, and Latitude 43. McDonough is passionate about helping to strengthen bonds between food enthusiasts on the North Shore and spreading the word about what a unique food community we have. It was an epic meal, and while the dinner series being offered to the public will be a slightly toned down version, it’s definitely worth keeping an eye out for. The dates and prices for these upcoming events are not set, but we’ll let you know as soon as they are, as they’ll initially be limited to 20 people. We’re told that the prix fixe dinners will likely be held once a month and will include both a standard and a cellar wine pairing option.